Flat designs in themes are the latest designs that everybody prefers. Even Google is also making its websites in flat designs now a day. Since these themes are simple and good in looks, the visitors are more attracted towards them. It is easy for the programmers and new users. In this article 20 flat designed WordPress responsive themes have been presented so that you can select the best one for you. For the advanced developers with good background of programming and the users with no programming skills, U-Design is a best theme that benefits both kinds of users. It is a powerful theme that will help you creating your site with very less time. It is highly customizable. Links, texts and backgrounds can be changed very easily and quickly. The availability of 600 font styles and the Google font library make it easy for the users to make their content more stylish. Adding to these features, UDesign contains around 6 sliders of Home page that is also very attractive for the users. 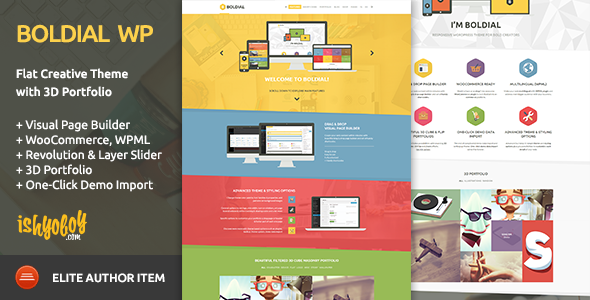 Brooklyn is a multipurpose and advanced one page WordPress theme. You can use it for your business purpose or you may convert it into your personal website. No matter if you are a traveler, a photographer, a web designer, a music producer or even if you run an organization, this theme best suites your demands. Full Screen slider, Parallax support, Translation ready and multiple sidebars are the best features of this theme. 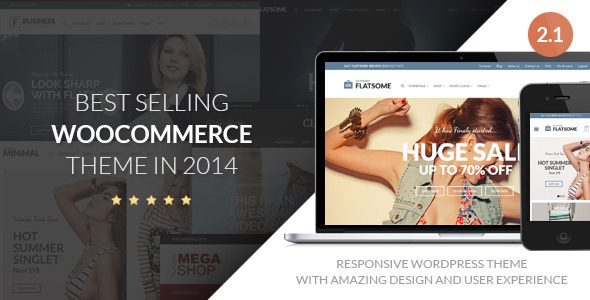 Make your shop good looking and attractive for your customers by using Flatsome theme. This is a highly responsive Woocommerce theme that is inspired by modern designs of eCommerce. The theme brings lifetime updates for free. It contains very attractive drag and drop page builder that are SEO optimized. For blog, portfolios and for showcasing your products, Beetle is a right choice. It is a highly responsive theme that is best for all fields’ users such as writers, designers or photographer. 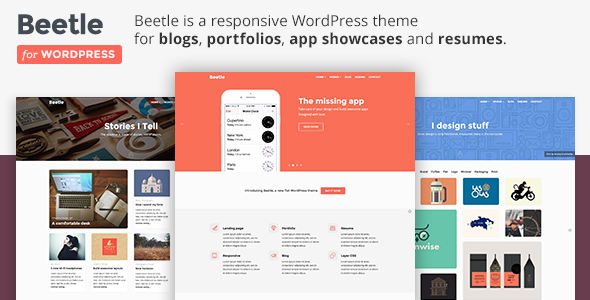 Beetle is a Retina ready completely SEO optimized tool. It has features of optional filtering that is supportive for unlimited portfolios. The features are explained in a documented file also attached with the theme. 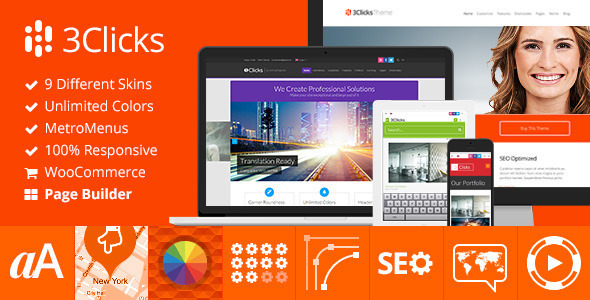 3Clicks present the most flexible and absolute solution for the blogs, business and portfolio sites and products. It is a complete responsive design that is built with HTML5 and CSS3 matching the current web requirements. Its demo content and skins and unlimited colors make it easy and quickly ready for working. The theme includes Browsers compatible Firefox, Safari and Chrome. With a huge collection of portfolio and blog designs, 3Clicks is a perfect solution for your sites. For those businessmen who deal in Real Estate, and want to develop their business through web, this theme is the best one. 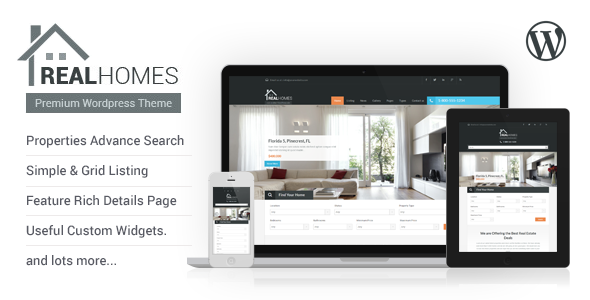 Real Homes has a nice and simple look and clean designs and it is loaded with a number of great features such as Google map with location makers, advanced searches, user manual, property submission and editing, and integration of payments with PayPal, IDX Plugins and many more. The theme comes up with easy options and layouts that are easily and quickly customizable. All those who want a simple platform for their sites where the visitors can easily focus on their works and products, this theme is a best solution. 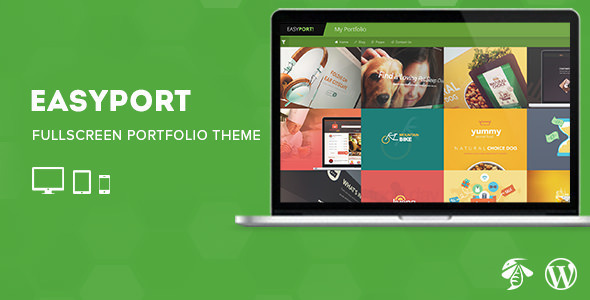 Easyport is a portfolio theme of WordPress that comes with a simple and easy look. It is a perfect full screen template for your portfolios. This is a highly SEO optimized theme with 11 short codes and advanced logo settings. Flato is a multipurpose one page v Card that allows you to place your personal and professional information on web. Whether you are a designer, programmer or manager, you can select this theme to create your own resume. With HTML5 and CSS3 coding, Flatoo brings pie charts and filterable portfolios that would help you describing your work. 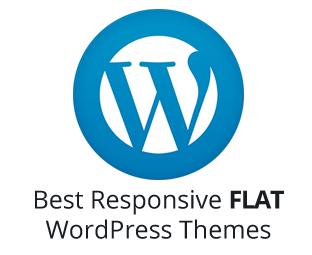 FlatHost is a highly responsive WordPress theme that is built in latest version of Bootstrap 3.2.0. Compatibility with Zompim live chat, domain search form, drag and drop page builder, awesome and stylish fonts and with many other features, FlatHost is a perfect solution for your site. 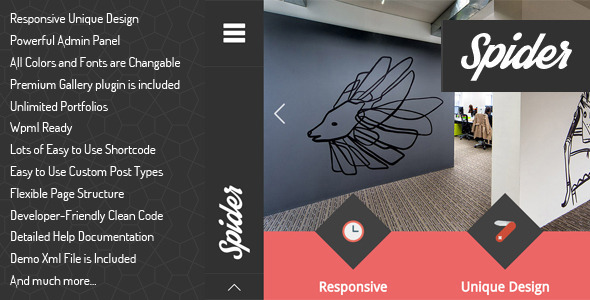 Spider is a highly responsive portfolio WordPress theme especially designed for the creative mind people and the services related to agencies. With colorful unique flat designs, unlimited color options and an admin panel with powerful options, Spider can be adjusted in all size of screens. 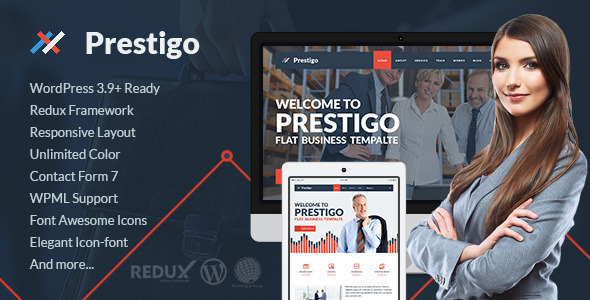 Prestigo is a great theme with RTL support. 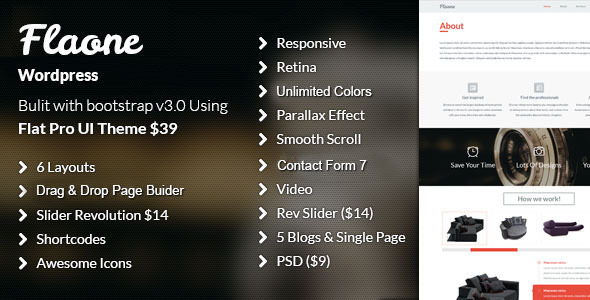 Responsive layout and drag and drop builder makes it more easy to use and responsive. It has unlimited color option and beautiful icon styles. The portfolio manager and job managers are useful features that make this theme more attractive. Boldial is a best theme for all colors loving web users who want the latest ways of presentation of for their charts and graphs. The theme contains 3D cube and 3D Flip portfolio options that can be extended easily. The more attractive parts of this theme are the stylish and advanced options and unlimited sidebars with multilingual ready options. The theme includes child theme as well. Flatone is built on bootstrap 3.0. 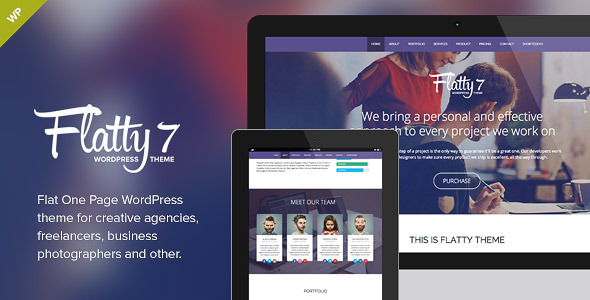 It is a highly responsive one page professional theme that is suitable for any kind of websites such as business, corporate, products, marketing etc. Bootstrap instructions make it easy to operate and edit. The theme comes up with 6 different styles of home page templates, 5 different blog ideas and many shortcodes to support your work efficiently. 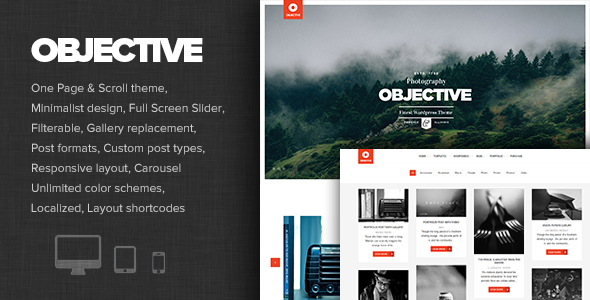 For photographers, and many other creative mind people who want to do web related works with creativity, Objective is the best theme. It is a highly responsive theme that contains advanced features such as, full screen sliders, portfolios with filter options, scrollable homepage and many more. There is a solid framework prepared on back-end for all the functions. 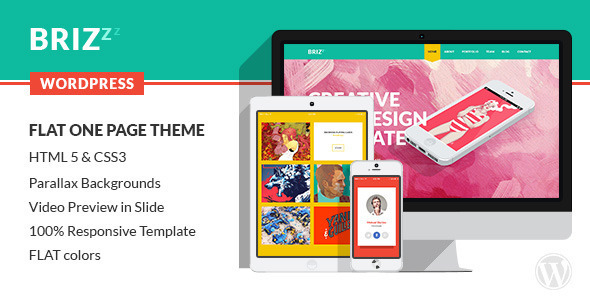 Brizz is a beautiful and modern flat style WordPress theme that is built on universal design. It is suitable for all portfolios such as, personal, agency, designer, photographer portfolios and many more. 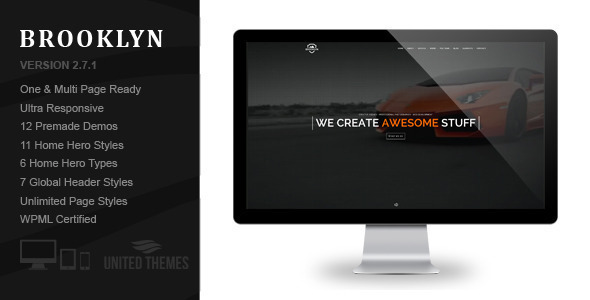 This highly responsive theme contains animated effects. It is easy to customize options as per your need and business requirements. 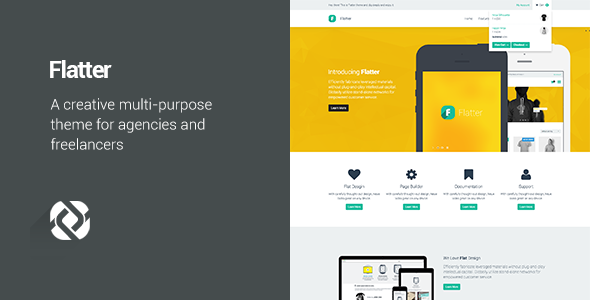 Flatter is designed on the basis of Bootstrap 3. This is a modern and creative designed theme that is suitable for any kind of business. The drag and drop builder contains 27 elements. It is a highly responsive layout that is adjustable in all devices. High quality admin panel has more than hundred options. The advanced footer options, a number of creative font styles and additional widgets make your work easy. 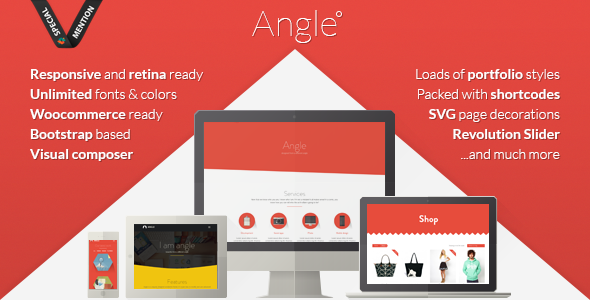 Angle is the theme that gives you freedom make any kind of website you want from this theme. 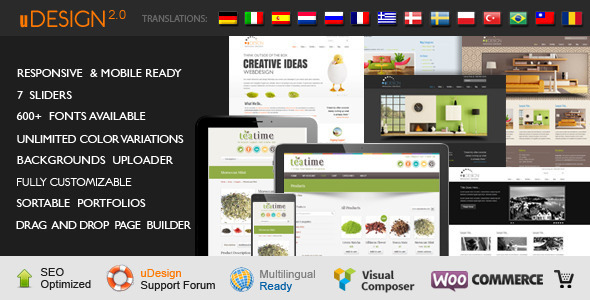 The theme contains WPML plugin that is ready to translate contents into any language. It includes layer slider plugins and has swatch editor. With beautiful icons, widgets and simple coding, It is a highly responsive template that can be used in any kind of template. 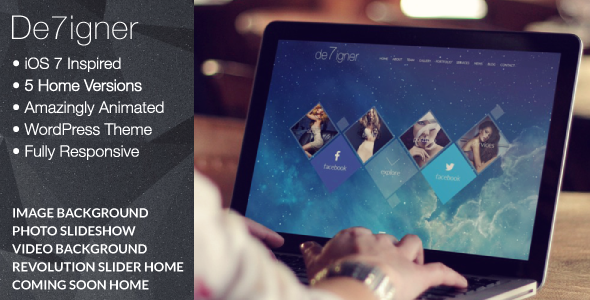 To give a best start to your business, De7igner is a very professional platform to develop your corporate website. 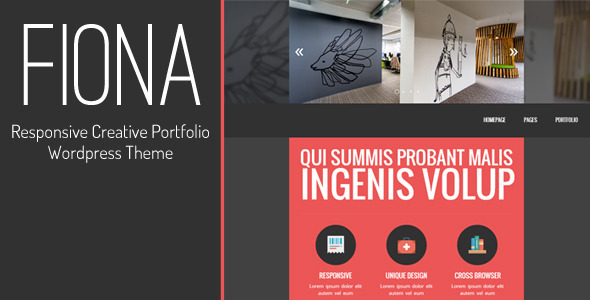 The theme gives unique looks and a different way to present your portfolios. 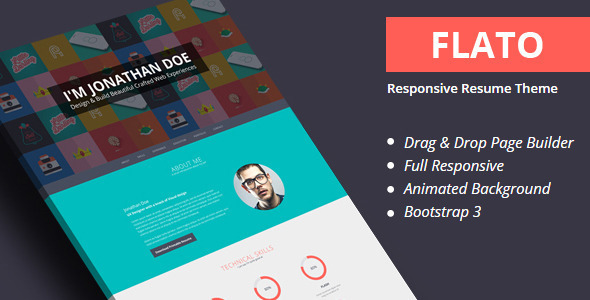 This flat parallax WordPress theme is highly responsive that can be adjusted in any device. It can easily be customized with different options. Fiona is a creative and modern WordPress theme that brings unique styles for its users. It is a highly responsive theme that is adjustable in any device. 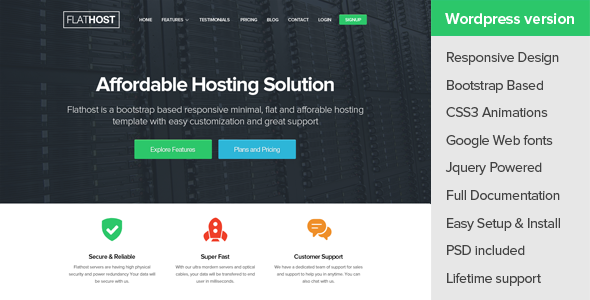 The theme is perfectly suitable for any personal and professional sites. It is easily customizable and contains latest features such as Portfolio filters, contact form, Google font support and many more. This is a one page, highly responsive flat style template that is suitable for creative minds, digital works, photographers, freelancers and businessmen. This theme helps you showcasing our products. It has full screen sliders and beautiful effects of parallax scrolling. The Editorial Team of MyBloggerLab consists of a group of Professional Blogger geeks Led by Syed Faizan Ali (Founder of MyBloggerLab). The craze of flat designs in the themes is in trend these days and users from round the globe prefer them over other ones. These templates look simple yet very stunning and best for grabbing the attention of your online visitors. The presented flat responsive WordPress themes are extremely beautiful and one should surely use them for their new WP projects to create a trendy portal. We’re eager to see your comment. However, Please Keep in mind that all comments are moderated manually by our human reviewers according to our comment policy, and all the links are nofollow. Using Keywords in the name field area is forbidden. Let’s enjoy a personal and evocative conversation. When is Getting a Credit Card a Good Idea? How To Block An IP Address on Blogspot Blog? Helping You to do Cool Things With Blogger Since 2012™. MyBloggerLab is a free online Blogger resource site. MBL was founded in the early days of 2012 by Syed Faizan Ali. The purpose of creating this site is to provide highly professional tips, top quality Tutorials, Practical SEO tips and methods to earn online. © Copyright 2012 - 2018. MBL Networks, All Rights are Strictly Reserved.